On this week's Naked Scientists, we seek the start of the solar system. We'll be finding out how clouds of gas and dust can clump and diversify to become stars, asteroids and the planets we know so well. Plus, we find out what happens to sculpt the surface of planets, and how the Rosetta mission will be the first craft to land on a comet! Also,how the smell of old books can help to preserve them, deleting old memories to make room for new ones and the frightening rate of Greenland ice loss. 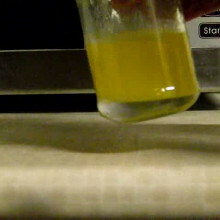 Plus, in Kitchen Science, Ben and Dave explain how margarine and meteorites tell us about Earth's origins! 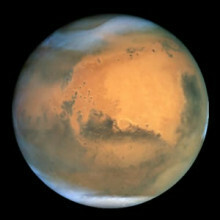 - What caused the red sands of Mars? What caused the red sands of Mars? We put this to Dr Matt Balme,Possibly, I think it's probably not the right reason though. I think the reason sands on Mars are red is really just due to a magnetite composition or ferrous iron mineral composition. You know, Mars may or may not have had an ocean. If it did have an ocean, it probably didn't exist for a very long period of time, relatively speaking, not like the Earth, which has been around for billions of years. So you know, we're loathe to rule anything out until we actually go there. I mean, that's one of the wonders of planetary science. There's an alternative answer to almost everything. Don't judge a book by its cover - judge it by the smell instead! There's the old saying, 'never judge a book by its cover' and indeed you shouldn't - now chemists are saying you should judge them by their smell, instead. 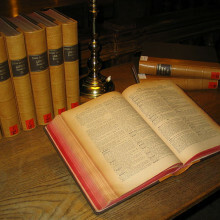 Publishing in the Journal Analytical Chemistry the authors have come up with a test that can measure how fast an old book is degrading, according to its odour. And this new sniff test could be really valuable to museums and document libraries because it has the potential to be completely non-invasive. And we actually did a question of the week on this about a year and a half ago, with one of the authors on the paper. Jana Kolar, together with colleagues from University College London and Slovenia have isolated the 15 main VO Cs - volatile organic compounds - which the paper releases. Each of these volatile organic compounds are emitted from the paper as a result of: the original make-up of the paper in the document, the glues used to bind it and the ink used for the print. The researchers looked at 72 papers from 19th and 20th centuries to find out which contained the most fragile components. They already knew these included rosin (pine tar) and wood fibre which are related to increased levels of acids, like acetic acid, in the paper as it ages. And these acids can eat away at the paper itself. So they collected and analysed the volatile organic compounds using a combination of gas chromatography and mass spectrometry. And then to 'test their own test' or find out which of these compounds were the ones libraries should be looking out for, they took a few small samples of the paper itself to look at its composition. Combining the results gave them 15VOCs which give an indication as to the condition of the paper and how much acid or even peroxide/ie. bleach it's producing as it decays. They've dubbed the smell test 'material degradomics.' And now that they know the smell test works on these 72 samples they can develop this method to be completely non-invasive. And that's useful to any old documents library because currently, you have to actually cut a small sample from a document in order to test how it's faring. And I'm sure many of you will have experienced these smells. They hit you like a slightly spongy wall when you walk into a well-established library like the ones you find here in Cambridge. The authors describe some of these smells as , "A combination of grassy notes with a tang of acids and a hint of vanilla over an underlying mustiness ." Lithium is the third lightest element in the Universe and small amounts were produced, alongside hydrogen and helium, by the Big Bang. Consequently it turns up together with these two other elements in stars and ought to be present in roughly the same amounts everywhere. But a long-standing mystery scientists haven't been able to explain is why some stars appear to have plenty of the stuff, the presence of which is apparent within the spectrum of light given off by a star, whilst others - our own Sun included - contain less than 1% of this amount. To get to the bottom of the problem, Garik Israelian and his colleagues, writing in Nature, surveyed more than 500 similar stars, including 70 known to have planets orbiting them. When the data from these stars were compared, and factors such as age were taken into account, a surprising trend emerged. Stars like our own Sun, with planets, lacked lithium, whilst their more lonely counterparts were more likely to be lithium replete. The researchers think that the presence of planets somehow stirs up the substance of the star, pulling the lithium from the star's surface to the much hotter interior where it is consumed. The team say it's now up to the theoriticians to figure out exactly how this happens, but the key point is that looking for a lack of lithium in the spectral signature coming from a star could provide space scientists with a shortcut way to find new planets much more quickly. Publishing in the journal Cell, neuroscientists reported that, in mice and rats, newly formed neurons seem to be deleting older connections. 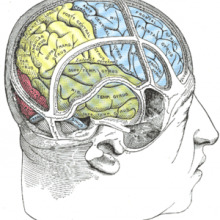 Kayoru Inokuchi and colleagues from the University of Toyama think that short term memory is updated by new neurons emerging in the hippocampus area of the brain, which is sort of in the bottom middle bit, and these new neurons essentially overwrite connections between the old ones. The researchers looked at this by irradiating rat's brains, which considerably slows down the formation of new neurons in the hippocampus. And they placed the rats in a chamber which would give their feet an electrical shock! Once the rats had this experience in their short-term memories the researchers applied a bit of x-ray radiation and afterwards the rats continued to use their hippocampus to recall that fear memory. But in those rats without x-ray treatment the fear memories were eventually displaced to elsewhere in the brain. The researchers knew this memory displacement was occurring because they also looked at mice which were born without the ability to make new hippocampal neurons and mice who received an infusion to block any neuron activity in the hippocampus. That way they could tell which animal was depending on its hippocampus for memory and which wasn't. Again, mice which couldn't produce new hippocampal neurons seemed to rely on their old short-term memories when placed in the shock chamber. And the researchers said this is because there were no new neurons to displace the old ones and essentially push them into long-term storage, somewhere else in the brain. They've known for a while that exercise can improve short term memory so they put some of these mice onto an exercise wheel and lo and behold, they did not use the same area of the brain for their fear memories. And the scientists think this is because the exercise made them generate new neurons in their hippocampi. So the conclusion is that if you can't make new neurons then you could have problems because the brain's short-term memory is literally full. So perhaps this could lead to a better understanding of memory-related diseases such as dementia and Alzheimer's. Chris - Well also in the news this week. We've got some worrying news emerging from Greenland because scientists have shown that the ice there is melting, and the time that it's doing that at, the rate which it is melting at is increasing. So the melt rate is accelerating. But how do we actually quantify how fast ice is melting from a land mass with any accuracy? Well, there's a paper in the journal Science this week, it's by Bristol University scientist, Professor Jonathan Bamber and his colleagues, and it might be able to help us. And Jonathan's with us now to tell us a bit more. Hi, Jonathan. Chris - Welcome to the Naked Scientists. So tell us, first of all, what the issue is with Greenland. Jonathan - So Greenland is the biggest ice mass in the northern hemisphere. It's got enough ice in it to - if it melted, if you took away a whole ice sheet. It would raise global sea level by about seven meters. Chris - To put that into perspective then we would be looking at, the Pennines would be about the only bit of Britain left above water, wouldn't they? Jonathan - No, no. It's not quite that bad, but you can say bye-bye to the Houses of Parlaiment which might be a good thing but, you know, I couldn't comment on that. But seven meters, that's what - about 25 feet, so I'm not suggesting that that's going to happen tomorrow or anything like that, but there is a huge potential for sea level rise in the Greenland ice sheet. I think the other thing about big ice masses like Greenland and Antarctica is that once you set them on a certain course, they're like the super tankers of the climate world. Once you've pointed them in a certain direction, it's very, very difficult to turn them another way. 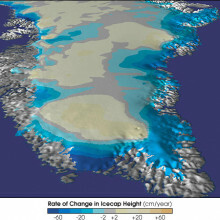 Chris - How do you quantify how much weight ice, water, is going from Greenland? Jonathan - Well, there's a variety of techniques. But what a lot of scientists have been very excited about in about the last five, six years is a satellite mission called GRACE, which stands for Gravity Recovery and Climate Experiment. It doesn't matter what the acronym is, but it's an absolutely amazing mission. It's actually two satellites and it's able to measure very, very accurately, small changes in the gravity field of the Earth. And so, if an ice sheet like Greenland loses mass or gains mass for that matter, it can actually measure those variations, and it does it on a, roughly, monthly timescale. Chris - And what has this told you? Jonathan - So a number of scientists have looked at this problem with GRACE and with other satellite data as well. And the problem is being with all the previously published results is that there's been a lot of variability in the numbers. In fact, the numbers have differed from each other by about a factor of two, you know, some have been double others. But what we've done is actually compared two different approaches using GRACE and an entirely independent approach for measuring the mass loss of the ice sheet, and they tie up pretty well. So it gives us a lot of confidence on our results, and we think that we've sorted out a lot of the issues that existed with earlier observations. And yeah, I guess it's a pretty disturbing picture. In the early '90s, the ice sheet looked like it was relatively close to balance, maybe losing 50 gigatons of ice. A gigaton is one billion tons. And in the last few years, that rate has increased to something like 273 gigatons a year and that's a lot of ice. Chris - That's - well, 273 gigatons, that's a cubic kilometre per gigaton. So that's 273 cubic kilometres. Jonathan - So, I mean, just kind of try and, it's pretty hard with numbers that big to really know what you're talking about here, but one gigaton is about the volume of Lake Windermere. So we're talking about 273 Lake Windermeres. Jonathan - Per year. But I think the other interesting statistic I like is that 4 gigatons is enough water to supply the entire domestic water supply of the UK. So 273 is pretty much the water supply of the whole planet. Chris - And that's just melting every year. Has that changed though because one of the points you make in your paper is that there appears to be an acceleration going on? This, one would presume, would be secondary to global climate change. So what's the pattern of that acceleration? Jonathan - We've seen - GRACE only went up in 2002 and the reliable measurements are only about six years of observations. So we don't have a very long record from GRACE, but just in that time, we have seen the rate of increase, increase by about 2.5 times. So I think the mean for the period for 2003 to 2008 is about 180. But the last two years, it's gone up to something like 270 gigatons a year. So that's a big acceleration in mass loss. Chris - So it's almost like Greenland is sort of a barometer of what's happening potentially in other bits of the world, isn't it? Jonathan - Well, that's one of the interesting things because I think until we started making some of these observations, most glaciologists and climate scientists felt that the ice sheets responded very, very slowly, and not very dramatically to climate change. What we're seeing in Greenland is completely the converse, and I think it's surprised a lot of scientists. 17:39 - Are we stardust? Yes, basically. The Big Bang produced hydrogen, helium, and as we mentioned earlier, a little bit of lithium. But most of the other elements, in fact all the other elements, had to be made somewhere, and the answer is they were all made in stars. And stars used fusion to combine a nuclear synthesis and supernova explosions to combine small elements to make bigger and bigger elements. And so, all of the elements that make your body today were made in the birth, growth, and death of stars that lived billions of years before you did. Isn't that amazing? Diana - Where do stars and planets come from? Here to answer that question is Professor Mark McCaughrean from the European Space Agency, where he's the head of research and scientific support. Hello, Mark. Mark - Hello, Diana. How are you? Diana - I'm very good. Thanks. Well, let's start off now with some of the earliest models of planet formation. So how did humans really start to think about where the universe came from? Mark - Well, I think there's lots of models which we know from all of the religious textbooks and so on, so if we step ahead from those and look where we were in the 1700's, 1600's, or so, and the important thing there is that this is after we realized and convinced ourselves that the sun was the middle of the solar system rather than the Earth. So once we got away from a Geocentric model into heliocentric, things start to fall in place. The few important pieces of evidence that come into that, firstly, all the planets go around the Sun in the same direction in the sky. They all,are more or less in circular orbits, and they are more or less all in one plane. And so immediately you might think that the solar system formed out of some kind of flattened disc around the Sun. So we started with Descartes, Kant, and Laplace, well-known philosophers of the day who figured out that if the Sun and the planets around it formed in a flattened disc, how would you actually get a disc to form in the first place? So as Chris just pointed out a moment ago, we now know that planets and the stars that they go around form from giant clouds of gas and dust. And those clouds have to collapse. And as they collapse down, they're going to flatten because they're rotating very slightly at the beginning, these giants clouds, and through conservation of angular momentum are going to spin up on one axis more than another, and end up being great, big, flattened rotating discs. And the philosophers knew that pretty well. So that's how we started off in the 1700's. Diana - How did they get to that understanding? What kind of technology did they have at their disposal? Mark - All they were really doing was applying, looking at observations of the sky with the naked eye, and with the first telescopes. So Kant for example, was well aware that the telescopes in the mid-1700's were able to start seeing faint, fuzzy, blobs out in space. And he thought those were perhaps dusty clouds which were beginning to form stars, and the planets that go around them. So there was technology in the use of telescopes, so mostly in terms of calculus and arithmetic. It was mostly theory work at that point. Diana - And coming to our understanding in the 20th century, what do you think were the key markers of our new, modern understanding? Mark - Well, what happened was very interesting. And so Kant and Laplace and later on, Swedenborg and others put this model together. There became a major problem with it. And that is if you look at the solar system which we live today, almost all of the mass of the solar system is in the sun. The planets have very little, less than a percent. But almost all of the angular momentum, the rotational angular momentum is actually in the planets. And that was a real problem because the model they had been developing couldn't account for that. How did that evolve? So, most of the mass was in the centre, but most of the angular momentum outside. So then it was for 60 or 70 years actually until the early 1970's a major diversion into what we would call "catastrophe theories" of the formation of planets. Catastrophe, in the sense that, nothing happened on its own. It happened in an event, a particular event, such as the passage of a massive star, a pre-existing star, passed a nebula, which then pulled-out through tidal forces, pulled-out a lump of material from this forming star. And that was then able to collapse the planet. There were lots of models like that. They were very, very reputable for 60 or 70 years. But then it was observations that brought us back to where we are today. And that is in the mid-70's, 80's, and then the 90's, we actually began to see that stars elsewhere in our universe were surrounded by discs of gas and dust. And that has brought us all the way back to the Laplace model, which is today called the "solar nebula model" in today's parlance. Diana - So it's kind of come full circle in a, sort of, century-like way. Can we actually see the stars and the planets forming? What does it look like in the telescopic images? Mark - Well, when we look at the stars today even the birth of stars, is an interestingly modern phenomenon. It wasn't until in the 1940's or so that we began to realise that stars had to be forming in our universe. And then we began to get evidence of that happening. There was an assumption before that many stars had just existed forever. They may have been born at one time, but the idea of star formation going on today is quite new. And so when we look at these places where stars are forming, and a very typical example is the Orion nebula, which many people will be familiar with in the night sky as a fuzzy patch in the sword of Orion just below its belt. What we see there are giant clouds of gas and dust glowing, being heated up by the hot stars, which have just been born in the middle. But we actually don't see much else with visible wavelengths. And that's because stars and planets are made out of gas and dust. And in particular the dust obscures our vision of the young stars. 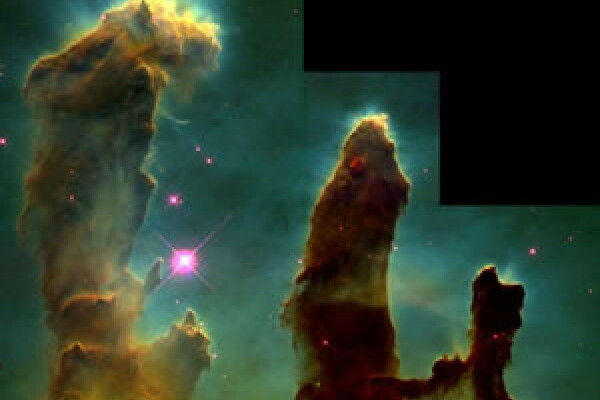 They're surrounded by this dust still, and you just can't see into those star-forming regions at visible wavelengths. However, if you look in the infrared or at much longer wavelengths, radio wavelengths, millimetre wavelengths, you can see a clear picture, and you can see these young stars slowly condensing, rotating at fairly high speed with discs of gas and dust around them, making planets. Diana - But stars are quite bright and exciting, but what about the slightly duller things like moons and captured asteroids, that sort of thing? Mark - Yeah, well that's an interesting question. I mean, how, for example, how the satellites in our own solar system, how the things going around the planets occurred. In fact, there's a whole list of things. 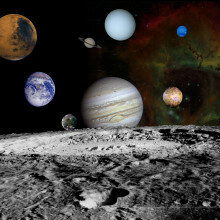 It may well be, for example, in the Jovian system around Jupiter and Saturn that most of the big moons there formed the same way that planets formed around the sun, through angular momentum being conserved, and condensation in the disc to form those planets. But then you have our own Moon, for example. How did that form? That's much bigger than any of the others, as a ratio to the size of the planet that is going around, and that may well have been a catastrophic event, where a rather large object, pre-existing in the solar nebular in the early stages in the first tens hundreds of millions of years. Our solar nebular was probably full of planets which aren't there today, big lumps of material. Some of which have fallen into the sun. Some of which have collided with other planets. And that's what we think happened to the moon, is that something hit the Earth, the young Earth. There was no life, of course there, and spun off a huge amount of material from the mantle, from the outer part of the Earth, and that then condensed into the Moon. Other moons going around other planets, for example, Phobos and Demos, the two main moons of Mars, are captured asteroids. They're very, very odd objects. They're not circular at all, and it seems as they got closer to the asteroid belt they just captured gravitation of it. 25:30 - What is dust? Well, by dust, we're talking about small particles, because remember that when things form to start with, they don't necessarily have to form big things and then be ground down into little things. Small things will attract other small things because they'll stick together, one way or another. So when we're talking about dust, we're talking about amorphous materials that can include big bits, small bits, and bits of gas. So it's a way of not having to define exactly what that entity is, but saying it's a mixture of chemical entities which have all of the necessary pre-requisite ingredients to actually form planets and stars. Chris - Now - Comets, with their iconic long tails, are one of the most interesting things we can see out in space from here on earth with the naked eye. We already know a bit about comets from observing them with ground and space telescopes, and through the Giotto mission, which flew past Halley's comet back in 1986. The Rosetta mission sounds like something straight out of Science Fiction, but seeks to do something no spacecraft has ever done before - land on a comet. This week it has done its final fly-by past Earth, and now it's heading off for its remarkable rendezvous. 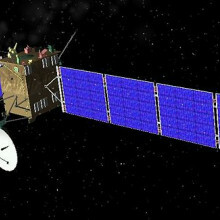 Ian - The Rosetta Mission is a dual spacecraft mission which aims to send both an orbiter spacecraft and a lander spacecraft to rendezvous with, and ultimately land on a cometry nucleus. Because of the distances involved, and the speeds involved, it's not possible to just launch from Earth and hope to get there directly. One has to travel around the solar system a few times, building up speed by having gravitational encounters with planets like the Earth and Mars, and then getting flung out into sort of, deeper space, and ultimately getting fast enough so that one can catch the comet up. Ben - It sounds like there's a lot that can go wrong. You're relying on this "slingshot effect" around lots of different planets, and then, you're catching something relatively small, a comet, millions and millions of miles away. Ian - It is quite daunting in a way. I think having been involved with a mission to Mars where, you know, you have something the size of a planet and it's something you can actually, you know, see quite easily from your back garden when the conditions are appropriate. You know, landing on a planet seems relatively straightforward. The comet is probably something like a kilometre or two across, and you've got a multi-billion kilometre journey to get there, and then you've got to find it, and ultimately land on it. It is amazing, and of course, in that sense, I'm in the hands of the spacecraft flight engineers who are experts in this field. Ben - And when did it actually launch? Ian - It launched in 2004. It's already been travelling a few years already, of course, building up speed. It's now going off into a hibernation phase where it'll be effectively in deep space ultimately hoping for a rendezvous and land towards the end of 2014. Ben - And once it hits its target, once it lands on this comet and sets the orbiter around it, what are we hoping to learn? Ian - The first thing that's quite interesting is, of course, one talks about an orbiter but actually you cannot really orbit a comet. It's so small, and it has no gravity. So, one of the first challenges is really to understand how to fly with it. So the whole concept of orbiting is quite strange. In answer to the question, you can make of this as, you know, as a human being if you're on Earth and you were going to visit a new country that you've never been to before. You'd have all kinds of questions that you'd want to know about the place. What's the weather going to be like? What's the temperature? What's the geography? What's the terrain? And in a human context, you know, what are the people like? What's the food like, and all that kind of stuff. Actually, you can pose very similar questions in relation to the comet, although we don't expect any humans on the comet obviously. But just simply any question you can think of about somewhere you've never been before, you know. What's it look like? What color is it? How cold is it? How active is it? Does it rotate? What's it made of? What's the surface like? Any of those questions, simple or fundamental questions, you can post about the comet. The Rosetta mission has been designed to try and get answers to as many of those questions as possible. Ben - Most space missions are actually very specific. They're out there to look at certain areas of electromagnetic radiation, or to look at very key things. It sounds like Rosetta is actually trying to be a bit of a Jack of all trades. Ian - Rosetta isn't any, particularly any different in a planetary exploration context. I think what a lot of planetary missions have is the widest diversity of instruments that they can possibly take. So for instance, you know, you want a camera. You want spectrometers. You want things that can detect magnetic fields. And once you get down to the surface, you want to know what's the constitution like, physically what's it like. Is it hard? Is it soft? It's not simply a mission that's going to go to a comet and take a picture of it. It's a mission that goes to ask many different questions, you know. The order of magnitude for the number of instruments is something like 20. I mean, there's, you know, there's like 10 on the orbiter, and 10 on the lander. All different instruments designed for different purposes. It's quite possible that they won't all work. I mean, there's a certain amount of redundancy in this. So, you know, one hopes the mission will be successful whatever happens. Ben - It's a very long way to travel if it turns out not to work. Is there anything that we can use if for on the way? Can we pick up bits of information about the environment it's travelling through? Ian - Well, yes, it is interesting, and although, I said previously it was about to go into hibernation actually, it's got one more stop. It's going to fly past an asteroid. It will be the second asteroid it's gone past during this phase. And yes, we use the opportunity at that point to turn some of the instruments on, again take photographs, look at magnetic fields, and so on. Again, the mission was designed so that it would actually do this along the way, so that, yes, it spreads out some of the scientific interest along the mission itself, because as you say, I mean, 10 years for a space journey, that is a long time. And it's a long time to get somewhere, and find things don't work. So the mission has already done some science, and they say, will continue to do some next year. Then hopefully, next stop the comet. 33:42 - Why do we only ever see the face of the moon? Why do we only ever see the face of the moon? The moon is orbiting the earth and rotates at a rate such that it turns around exactly once per orbit. This means that the same face is always presented to the Earth. A similar example is if you get a friend to walk in a circle while always facing the centre, they are rotating once every orbit. The obvious question is why did this come about, is it just fluke? It is all because of tides; the gravity from the moon distorts the sea (and to a lesser extent the Earth itself) into an ellipsoid. As the Earth rotates this distortion moves around the Earth triggering the tides. The energy to drive the tides comes from the Earth's rotation and the earth is slowing down its rotation - we know that there were 400 days in a year 250 million years ago by studying corals - the Earth also creates tides on the Moon; But because the Earth is about 80 times heavier than the moon they are far stronger. Originally the Moon was spinning, but these immensely strong tides required so much energy that the Moon's rotation slowed down so much it is now always facing the earth. Essentially there are still tides - the moon is distorted, but they are locked in one place, so it is said to be tidally locked. Chris - So we've heard how stars and planets first form from clouds of gas and dust in the atmosphere, and there are lots of other different processes that go on once these planets are formed though. And that means weather and volcanic activity, meteorites coming in, movement of ice or ocean swells, they all contribute to shaping the surfaces of planets, and it's often hard to work out exactly what's been happening when you try and wind the clock back. But one planet we do know quite a bit about is Mars, and Dr. Matt Balme is a researcher at the Open University, and he actually been looking at the various changes that have helped to scope the Martian surface. And he's with us now. Hello, Matt. Matt - Hi there. How are you doing? Chris - Very well, thank you. So tell us a bit about your research on Mars. Matt - Well, I look at surface processes on Mars, and these are generally, at the moment, things do with either wind, water or ice. And I think Mars is a majorly interesting planet to look at because it has an atmosphere. It has ice. It has water, or had water. And you know, so in many ways, it's very like the Earth, and all the same processes, all the same physics happens on Mars as happens on the Earth. And it's also got a little extra added piquancy which is, there may or may not have been life on Mars at some point. So that's really why we aim to look at these processes, it's all really tied into the search for habitats, and the search for evidence, possibly, of life on Mars. Chris - It's interesting you mention the biological role of shaping surface in Mars, because we've had an email from Blaine who says, "Were the red sands of Mars caused by biological activities because when the levels of oxygen rose on Earth billions of years ago, large quantities of iron rusted out of the atmosphere, and that left iron oxide deposits in rocks. So could the same thing have happened to Mars?" he asks. Chris - People have found quite good evidence for a lot of water on Mars in the past, and correct me if I'm wrong, an ancient tide line a sort of, an edge of where that ocean would've been, but I think that the ocean, being long gone, that tide line has been reshaped by the geological processes. So it's all higgledy piggledy. But is there, nonetheless? Matt - Well, it's controversial. There are quite a few groups of scientists who think that when you actually look at the more recent data that we have from Mars, which have a much higher resolution in terms of, you know, how many meters each pixel in the image actually represents on the ground, they haven't found any good evidence for these shorelines. So the shorelines are still heavily under debate, and again, Mars planetary science as a whole, it's a science influx. There's a lot we don't know. And as each hypothesis gets built and then torn down again, eventually, we are closer and closer to the truth. That's, I guess, why it's so exciting. Chris - So what are you actually looking at directly yourself? Matt - At the moment, I'm doing an awful lot of work on what are called periglacial terrains. And they are terrains that have a lot of ice in the surface, but also some degree of thaw. And if you've ever been to, let's think, Siberia or Northern Canada, you might have seen these amazing patterned grounds, sorted stone circles, and stripes. And they almost look like human beings have made them but actually they are a class of self-organizing landform, which means that, as you have a cycle of freeze and thaw, rocks get moved by frost heave, so ice has a different density to water. You get differential movements of rocks. It actually saw some amazing circles and patterns, and we have been seeing very similar sort of things on Mars. And obviously this is quite controversial and quite interesting because you can only get this if you have some elements of thaw of ice. So up until this point, a lot of people have said, "Well we know there's ice on Mars, and we know there was water years ago, but we don't think there's actually been any melting of the ice or not significantly for maybe hundreds of millions of years." But what we're looking at are sorted stone circles, and sorted stripes, and all sorts of other periglacial landforms that looked just like the sort of landforms you see in Siberia, or Alaska, or Canada. So the conclusion is, there's been some thaw in the very recent past on Mars. Chris - And what are the implications of that, Matt? Matt - Well, I think the implications are that the climate was perhaps warmer than we previously had thought, you know, just in the last few millions years. Or that maybe there's some other unknown process that allows this ice to thaw, so maybe there's an awful lot of salts dissolved in it. And that's, you know, anyone who has thrown salt onto the drive to, you know, help clear the ice knows, that you have salt in your water that depresses the freezing point. So, you know, all these things are interesting because they hint a possibility of a more habitable Mars than we previously thought. Chris - Which of course, might have implications for not so much life once, but the existence perhaps of life today? Matt - Well, yeah. I have to say I'm generally a bit of a non-believer in terms of life on Mars. I tend to think that if life ever got going it would be so obvious that we'd be able to see it from Earth very easily. But, you know, it does imply that if Mars was more recently wetter than we thought, it has a much higher chance there being current life or dormant life. Maybe if it was a million years ago there was habitability, obviously even if that stopped half a million years ago, and everything that was alive there is now dormant, we wouldn't be able to see it unless we actually got in there with a shovel and started digging. Chris - What can we learn by studying these sorts of things on Mars about other planets, maybe not even in this solar system? Matt - Well, Mars is a counter-example to the Earth. Everything we know really about geology and planetary geoscience in general, we basically we know from the Earth. Studying Mars gives a point, counterpoint sort of ideas about how planets evolve. In terms of outside the solar system, it can give us hints about sort of things we might be seeing, but of course, it's going to be impossible for us to ever, or I say ever but, in our lifetimes ever have our hypothesis tested. You know, you may think, "Oh perhaps this exoplanet has sand dunes, or glaciers, or rivers" but we'll never know. You know, at least not in our lifetime. 49:33 - Where do comets get their water from? Where do comets get their water from? We posed this question to Dr Mark McCaughrean...Yes, I think one of the things you have realize is that when the solar system was very young, it was very much hotter. And so, you had a lot of water in the solar system, but out at about Jupiter was pretty much evaporated off or incorporated into places like the Earth. But the comets are very big lumps of icy dust and muck still leftover from the early part of the formation of the solar system. It's just leftover stuff. 50:08 - How do planets spin and move simultaneously? How do planets spin and move simultaneously? Well, it's a fairly simple piece of physics. One of the things that keep on moving their orbit, there's nothing to stop them! I mean, they're not hitting anything, so to speak. So they're not losing any energy, and they're not losing, more importantly, angular momentum. So angular momentum is a conserved thing. It can't just be taken away by, just by wishing it away. It has to be taken away by things, and the Earth is just sitting there, rotating. Nothing's taking its angular momentum away except the Moon. The Moon is actually going to steal some of the Earth's angular momentum, slow it down, and at some point in the future, the Earth and the Moon will be locked together they would both have lost angular momentum. At the moment, we only see one face of the Moon. In the future, only one face of the Earth will be facing the Moon. So we'll only be able to see the Moon from one side of the Earth, and vice versa. 51:06 - Why is it that stars appear spiky and not spherical? And why do they twinkle? Why is it that stars appear spiky and not spherical? And why do they twinkle? 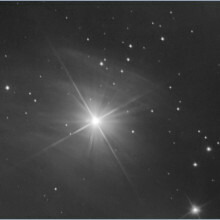 The main reason that stars look spiky is that the optical instrument you are looking at them with is not perfect. Because light is a wave, if you shine it through a small hole you get a pattern known as an interference pattern, this is because different light waves interfere with each other, making patterns of light and dark. If the hole was circular you would get a relatively clean picture, but if it isn't then you will get various visual artifacts. These are much dimmer than the object itself so during the day you can't see them, but if a bright object is surrounded by darkness they are very obvious.So if you look at a streetlight you often see streaks coming off it. If you squint, you make your pupil even less circular so the streaks get much stronger. The interference pattern will have a similar symmetry to the hole, so if you squint your eyes into a slit you get 2 strong streaks. Your camera doesn't have a perfectly circular aperture so you get streaks, the number will depend on the shape of the aperture.Large telescopes need structures to hold their secondary mirrors, and it is the diffraction from these that you see in pictures from the Hubble Space Telescope etc.Chris - But the reason they're actually twinkly when we look at them is nothing to do with that. They're twinkly when we see them through the Earth's atmosphere because the Earth's atmosphere is not uniform. There's air which is at hotter temperatures, and therefore, less dense, and there's air which is at colder temperatures, and therefore, more dense. And when light goes from a medium, which is more dense, into a medium which is less dense, it changes speed. In fact, it speeds up a bit. And it's that change in speed that causes the light to bend a little bit. And that means that when you see rays of light coming from a long way away, they appear to be coming from one place, and then another place, and another place, and then another because the light rays are being bent alternately as it goes in and out of warm and cold patches of the Earth's atmosphere. And that's what makes the star twinkle. And you see the same thing happening if you look at the lights from a harbour across a sea harbour or a port, for example. Diana - And you can also get polarised filters to put on your camera. They will make the stars appear to point in numerous different directions, as well. 52:27 - Why are electric kettles noisy when they're heating up? Why is it that electric kettles make noise when they’re heating up? 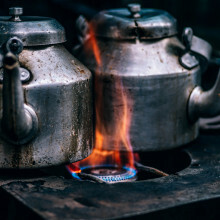 Why are electric kettles noisy when they're heating up? The water expands around the element to a point where it wants to boil. This forms a bubble of water gas, or steam, close to the element. This bubble, as it rises through the water, then it gets cool, and collapses in on itself violently; this is called cavitating. It goes "bang", or "pop" - it's a sort of reverse pop - and that's the noise you can hear. 52:59 - Red sky at night, shepherd's delight? Why do we get red sky? Does it really serve as a warning for the following day's weather? John - Well, we get red skies, well of course here in East Anglia the skies are pretty impressive because of the lack of hills or mountains mean we see so much more of them as well. 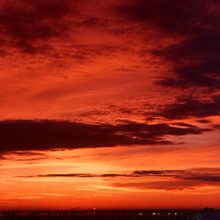 But we usually get these red skies because of how light is reflected and bounces around, basically, in the atmosphere. Now we get them mostly, of course, first thing in the morning or last thing in the evening, especially because the Sun is so low. All the other elements of the spectrum if you like, right the way down towards those blues and indigos are being bounced around the atmosphere, leaving behind those that are the oranges and reds. You need, of course, the angle of the sun to shine from underneath the cloud up towards the base. So you can see it from the ground. But when you've got higher cloud, then you've got more chance to do that. Now, when you get higher clouds, what often can be the case is that you've got clouds called cirrus clouds, more cirrusstratus or altocumulus clouds which are fairly high in the atmosphere. So they're anything from, say for example, 10,000 feet right up towards 30,000 feet. These clouds themselves can be the forerunner to a weather system coming in off the Atlantic Ocean and then overnight, of course, that cloud lowers at the front, this weather system, moves in from the Atlantic Ocean and brings us a spell of rain. Or even, perhaps, snow during the winter, of course, as well. Of course, you get the converse effect during the course of the morning, when you have "red sky in the morning-shepherds' warning", which I suppose is not very good news if you've got sheep, and you want them to keep dry during the day because, of course, that means red sky on the morning but the cloud's going to lower so you'll be getting rain but during daylight hours rather from darkness. Could other planets make a substance like diamond? Why don't Saturn's rings aggregate to form moons?